Fill your open-air space with lots of shade! With the Treasure Garden cantilever umbrella base, using a large cantilever outdoor umbrella is an easy option. This heavy duty umbrella base is designed to hold your outdoor umbrella in place adding the shade you desire over your deep seating set or larger dining area. 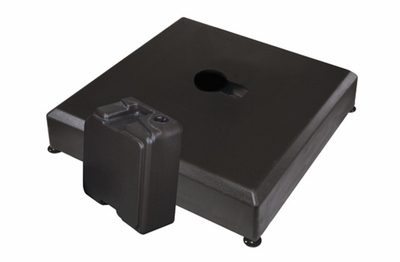 This patio umbrella base includes the base frame, base cover and 4 add-on weights. The base will hold up to 400 lbs. of sand ensuring your patio umbrella stays right in its place no matter the weather conditions (sand not included). This is a very heavy duty stand that is superb for either commercial or personal use and with its gorgeous finish it will work beautifully with any decor. This is a functional and stylish addition to your patio space that will complete your upscale outdoor look.